While the Oculus Rift is mostly being viewed as a video game device, Facebook CEO Mark Zuckerberg seems to think it can be quite a bit more than that. If there is anyone the public should listen to on this kind of thing, it’s the man whose company spent more than $2 billion in order to buy Oculus VR, the maker of the virtual reality wearable devices. In a public Q&A last Tuesday, Zuckerberg claimed that Facebook wants to be able to give “people the power to experience anything.” According to the IB Times. "Even if you don't have the ability to travel somewhere or to be with someone in person, or even if something is physically impossible to build in our analog world, the goal is to help build a medium that will give you the ability to do all of these things you might not otherwise be able to do," Zuckerberg wrote. Zuckerberg is also pushing hard for 3D video and he says that Facebook and the Oculus will soon be able to support this particular technology. While people are looking forward to seeing their favorite video game in this device, Facebook sees it as more of a communication device. 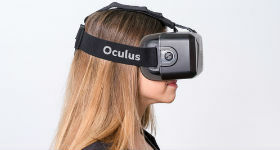 It doesn’t appear that Zuckerberg is the only one who has big plans for VR. While this tech has been around in some form or another for more than a decade, there are a number of companies that are working hard to finally bring the tech to the top of its potential. The purchase of Oculus by Facebook seems to have started a bit of an arms race in this particular sector. Other companies are working feverishly, including video game platform maker Valve, in order to get their own VR tech onto the market. One of the reasons they are working so hard to get their own devices out there is because despite all of Zuckerberg’s big talk, the social media giant still hasn’t announced when they expect to bring the Oculus Rift to the masses. Only time will tell how this all unfolds.